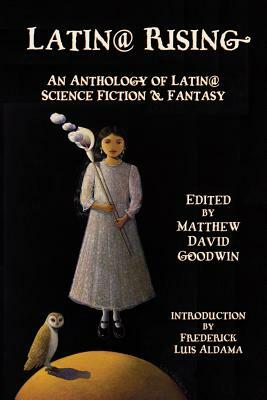 Latin@ Rising is the first anthology of science fiction and fantasy written by Latinos/as living in the United States. The 22 authors and artists included in this anthology come from all over the U.S. and from eight different national traditions. They include well-known creators like Kathleen Alcalá, Pablo Brescia, Sabrina Vourvoulias, Ana Castillo, Junot Díaz, Richie Narvaez, Giannina Braschi, and Daniel José Older; they also include new voices, well worth hearing. The book gives an overview to the field of Latino/a speculative, showing the great variety of stories being told by Latino/a writers. Fifty years ago the Latin American "Boom" introduced magical realism to the world; Latin@ Rising is the literature that has risen from the explosion that gave us García Márquez, Jorge Amado, Carlos Fuentes and others. The 21st century writers and artists of Latin@ Rising help us to imagine a Latino/a past, present, and future which have not been whitewashed by mainstream perspectives. Contrary to the popular perception, Latino/a Literature is not just magical realism and social realist protest literature—it also contains much speculative fiction. By showing the actual breadth of genres being used by Latino/a authors, Latin@ Rising will help extend the boundaries of the Latino/a literature canon. Latin@ Rising demonstrates the value of speculative fiction for the Latino/a community: it gives Latinos/as a vital means for imagining a past and a future in which they play a pivotal role, and it constitutes a narrative of the effects of technology on the Latino/a community. The book shows how the richness of the speculative genres provide U.S. Latinos/as with a unique medium to discuss issues of colonialism, migration, and the experience of being bicultural. Matthew David Goodwin is an Assistant Professor in English at the University of Puerto Rico in Cayey. His work is centered on the topic of migration in Latino/a literature. In particular, he looks at the ways that science fiction, fantasy, and digital culture have been used to express the experience of migration. He completed his PhD in Comparative Literature at the University of Massachusetts–Amherst in 2013. He has published a number of essays on Latino/a speculative fiction for journals. Frederick Luis Aldama is University Distinguished Scholar as well as Arts & Humanities Distinguished Professor of English, Spanish and Portuguese, at Ohio State University where he is also founder and director of the White House Bright Spot Awarded LASER (Latino & Latin American Space for Enrichment & Research) that creates a pipeline for Latinos from 9th grade through graduate and professional school education. He specializes in Latino and Latin American literature, comic books, and film—and pop culture generally.